Condensate is generated in the steam pipes due to heat loss and due to energy required during system heat up. For the steam system to work properly it is important that the condensate is removed. The recommended drip leg dimension for a 80 mm (3 in) steam pipe is 80 mm (3 in). The pocket depth should be 700 mm (28 in). Engineering ToolBox, (2016). Steam Pipes - Installation of Drip Legs. 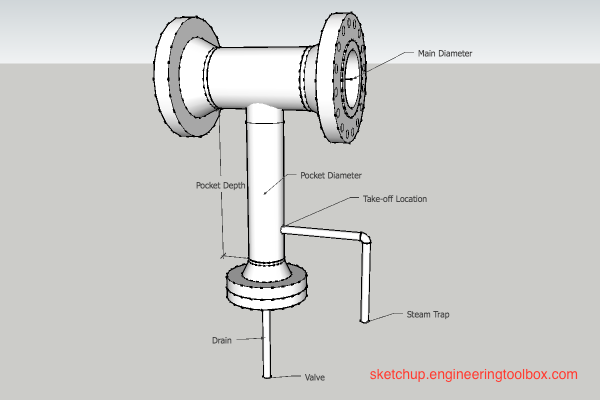 [online] Available at: https://www.engineeringtoolbox.com/steam-pipe-drip-legs-d_1927.html [Accessed Day Mo. Year].